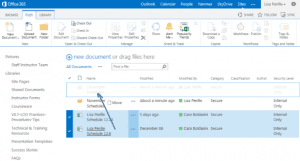 The “Drag and Drop” feature is one of the greatest new features in Microsoft SharePoint 2013. You can use this feature when moving one or more documents. You can drag and drop documents from one folder to another, one library to another and from windows explorer to the library. Open your windows explorer window and restore the size of the window so it can be viewed on the same screen with your SharePoint window. In SharePoint, open the library that you will be copying your files into. From the windows explorer, select one or more files. 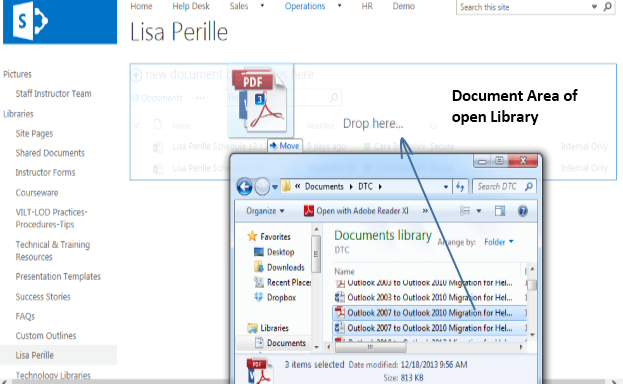 Drag the selected range of files to the Documents area of your library. The files are now copied to the SharePoint library. In the Screen below we selected two documents in the library and dragged them onto the folder, December Schedules. 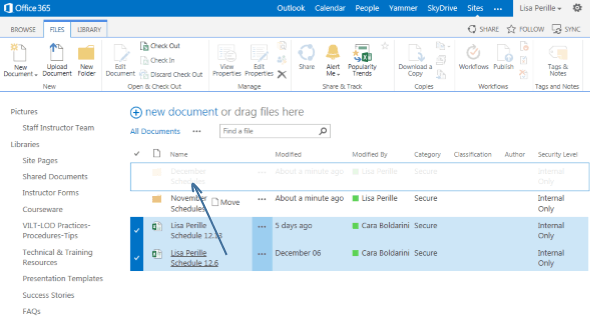 Once you drop the documents onto the library, they are moved to the folder you selected. Destination Library should exist in Quick Launch. You cannot move documents in Libraries from another sites collections added to quick launch. Version History is preserved if the destination library also has versioning enabled. This does not work if publishing is enabled at the site collection.